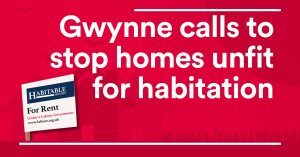 Denton and Reddish MP, Andrew Gwynne, is backing a Bill being introduced by Labour MP Karen Buck this Friday 19 January which will give renters a new legal right to ensure their home is ‘fit for human habitation’. This change in the law has been backed by Labour previously and was included in the Party’s June general election manifesto but has been blocked by the Tories on two previous occasions. However, following a Labour campaign, the government now say they will support the legislation. “Sadly families, couples and single renters alike all have fewer rights in the rental market than a person buying a fridge-freezer. Decisions made by Conservative Ministers have made it even easier for landlords to let unfit homes.